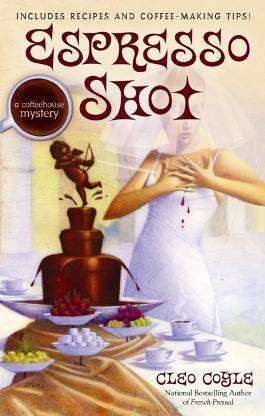 The pseudonymous Coyle (a husband-wife team) makes the jump to hardcover with this enjoyable coffeehouse mystery, the seventh in the series to star Clare Cosi, the crime-solving barista of Village Blend (French Pressed, etc.). Breanne Summour, the disdainer-in-chief of Manhattan fashion magazine Trend, is engaged to be married to Matteo Allegro, Clare's ex-husband. Sharing a grown daughter, Clare and Matt remain friends and business partners. When a 22-year-old dancer who looks like Breanne is shot after performing at Matt's bachelor party, a frantic Matt believes Breanne was the intended target. Clare agrees to protect Breanne until the posh wedding at the Metropolitan Museum of Art, but after the murder of Breanne's former assistant, Clare's life is in jeopardy, too. This mellow-paced cozy includes some surprises for both bride and groom, who must deal with the bitter fruits of their past actions. Recipes and coffee tips are a bonus.